On November 9, 2009, The Cruise Examiner wrote a column entitled "New Ports: Coney Islands of the Seas?" 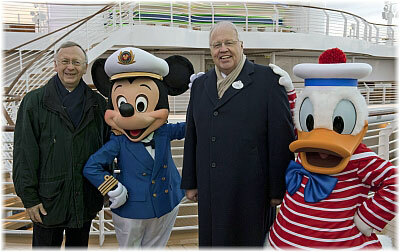 but now, only a year later, we find not only roller coasters ashore but Nickelodean and DreamWorks characters joining Mickey Mouse and Goofy on board cruise ships, with one ship even being christened by a cartoon character. It appears that ships have caught up, with some of the bigger ones actually having become floating theme parks. Elsewhere, we have a look at cruise plans for the Port of Marseilles and revisit some on board spending statistics from last week. Well, this year it has all finally come true, and in a way that is quite surprising really. The evolution of cruise ships has now worked its way from traditional cruise ship through floating resort to its latest incarnation, floating theme park. Bob Dickinson at Carnival Cruise Lines used to say that cruising's real competition was not other cruise ships but Las Vegas and land-based attractions. But in the past few months, it has not been Carnival that has taken on this competition, but its arch-competitors in Royal Caribbean and Norwegian Cruise Line. Contrary to what some may have expected, in the past, Carnival is now emerging as one of the more conservative lines. When ships started to be built of a size above 100,000 tons it began to be said that they were no longer cruise ships but were in fact floating resorts, complete with their spas and various other divertissements. Even Douglas Ward of the "Berlitz Guide to Cruising" started to call them floating resorts. But in the past year, with ships either side of 200,000 tons, we have in fact been presented with floating theme parks, with Starbucks, Guess shops, beaneries and yes, kids' entertainment. NCL was the first to follow in the steps of Premier and Disney by signing to bring cartoon characters on board, in their case, from Nickelodeon, which previewed on Norwegian Jewel in April and on the new Norwegian Epic in July. NCL was followed six months later by Royal Caribbean International, who signed a similar deal with DreamWorks Animation, and went even further by engaging the fictitious character of Princess Fiona to christen their latest and greatest ship, the Allure of the Seas. 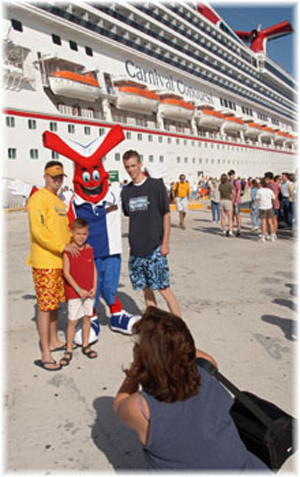 Premier Cruise Line, founded in 1983, had been the first line to adopt cartoon characters. Working with the Universal Studios theme park at Orlando, it also obtained a contract from Disney to package its 3- and 4-day cruises to the Bahamas from Port Canaveral together with a visit to Disney World at Orlando. Sold as "the official Disney cruise line," its ships were also marketed under the name "The Big Red Boat," and they sailed from Port Canaveral because it was the closest cruise port to Orlando. When Disney decided to start its own cruise line in the early 1990s, Premier signed a deal with Warner Brothers and the cartoon characters appearing on board became those of Looney Tunes instead. In those days, this was a minor part of the market, operated by second-hand ships sailing from an out-of-the-way port. After trying to get into the mainstream cruise market as well using more second-hand ships, Premier would survive for a while but eventually go bankrupt in September 2000. With the formation of Disney Cruise Line, brand-new ships were introduced to the Port Canaveral-Bahamas circuit with the 83,300-ton Disney Magic in 1998 and her sister ship Disney Wonder in 1999. The first real ships to operate more or less as theme parks, these 1,750-berth sisters offered complete facilities for families and specific facilities for children of all ages. While Disney operates more as a niche product than a mainsteam one, this is not a detriment. In fact, Disney's niche has allowed it to charge a premium on fares compared to the more mainstream lines. Last week, Disney's expansion continued when it took delivery of its third ship, the new 122,000-ton Disney Dream, with 2,500 lower berths. She will be followed by a fourth, her sister ship Disney Fantasy, in 2012. Through expanding its itineraries into Europe, the Far East, Alaska and the West Coast, Disney Cruise Line has expanded its scope of operation but also continued to be a non-mainstream type of operation. More alarming than Premier or Disney, is the crossover that is now taking place into the mainstream market, where cartoon characters have invaded the normally more restrained world of cruising. This started on January 13, with NCL announcing that it was introducing "Nickelodeon at Sea," with a claim that Nickelodeon was the "number one entertainment brand for kids." Beginning in April on Norwegian Jewel and in July on Norwegian Epic, strange characters such as Spong Bob Square Pants and Dora the Explorer began to appear on what used to be quite normal cruise ships. Nickelodeon at Sea had ironically started as a joint venture of Viacom, its owners, with Norwegian Cruise Line and Royal Caribbean International, but after a couple of test cruises by Royal Caribbean in 2009, they dropped out. The NCL and Nickelodeon announcement has been carried a step further by Royal Caribbean, who announced on June 4, that it had signed with DreamWorks Animation to offer similar kids' programs. Starting with the Allure of the Seas on December 1, this contagion will spread to the Oasis of the Seas, Freedom of the Seas and Liberty of the Seas in 2011. Instead of Sponge Bob, the likes of Shrek, Princess Fiona and Kung Fu Panda will appear on board, "live and in person" according to Royal Caribbean. The reality, however, will be that some poor real person will be in each costume, perspiring profusely in the Caribbean heat. One irony is that, although this could change, DreamWorks Animation films are distributed through Viacom's Paramount Pictures. So there is a Viacom connection with both NCL and Royal Caribbean's kids' programs. In the case of both NCL and Royal Caribbean, passengers can look forward to themed interactive shows, poolside entertainment, character breakfasts, character meet and greets, dance parties and more. We can only hope that they do like Disney Cruise Line and announce when these various sessions will be held, so that more serious-minded adults can avoid them. And in an underhanded sort of way, NCL will be charging for the kids' parents for character breakfasts, where their children get to meet who they think are their heroes, while Royal Caribbean will be holding regular parades on their Royal Promenades. In the end, trying to attract the kids market really seems sneaky. It's like trying to sell cruises the way sugar-coated cereal companies and chocolate bar producers used to advertise their goodies on television. The aim is clearly to attract more families to cruise, and it appears that the debate will no longer be whether to appeal to the husband or the wife but how to get at them through their children. A couple of things are interesting here. First, at least for now, these programs are restricted to only a few ships, something that indicates that they are probably still under trial. And second, Royal Caribbean has already tried this with Nickelodeon but gave it up. Presumably they feel that DreamWorks is a better asset than Nickelodeon. On the other side, it is interesting that Carnival has not signed up for any kids's shows yet, nor does it seem to feel it has to. In fact, its newest ship, Carnival Breeze, will be the first whose interior design is not headed up by iJoe Farcus. Perhaps these are signs that it might be interested in picking up that element of the clientele of their competitors that will be disaffected by these childish hijinks. Meanwhile, the children's entertainment contest goes international in 2011, with Nickelodeon signing a deal with Blackpool's Pleasure Beach, where a Nickelodeon Land is set to open in April, and Shrek the Musical scheduled to open at London's Theatre Royal in Drury Lane in May. But what has this got to do with cruising? Recently, The Cruise Examiner berated the French market for not having much enthusiasm for cruising. While Germany provides the largest outgoing travel market in the world, exceeding the Americans, it produces a million cruisers a year. And even this is a poor performance next to the British, who produce 1.6 million cruisers on a population of 60 million, compared to Germany's 80 million. If Germany had the same market penetration as the UK it would be producing more than 2 million cruisers a year. Spain, with a population of 45 million, produces 600,000, and Italy, with a population just below that of the UK, produces 800,000, indicating that with the same penetration as in the UK, and so many seaports, Italy should be able to double its cruise business. Meanwhile, in France, the largest incoming travel market in the world, with 5% more population than the UK, the number of cruisers should be up around 1.7 million. Instead, in 2009 it was not even 350,000, or below 20% of its potential. But with the introduction of the Grand Mistral next year and L'Horizon replacing Bleu de France in 2012, the Port of Marseilles is taking a positive view. With five cruise ship berths now in service, it intends to expand to six by 2012. The reason for its confidence? For many years, the French market produced only about 200-250,000 cruisers a year, but now the Marseilles-Fos Port Authority is expecting 350,000 embarkations in 2011 and is aiming at 500,000 in 2012. The recent figures were 180,000 for 2009 and 275,000 this year, a better than 50% increase year-on-year and cause for optimism it seems. Although the Port of Marseilles' projections are larger than the actual size of the French market, they count on Benelux cruisers.being able to arrive by high speed train from Brussels and Luxembourg, and about 15% of their passengers coming from other locations such as the UK, Germany and Scandinavia, not to mention parts of Italy. Indeed, UK passengers, like those in the Benelux, can also come by fast train, with a change from Eurostar to TGV now possible at Lille. And with Croisières de France, Croisières Paquet, Compagnie du Ponant and Plein Cap all supplying a native Francophone element, Costa, MSC and Louis Cruises are also very active in Marseilles, with all three of them being active shareholders in the Marseilles Provence Cruise Terminal since April 2009. At least someone is trying it seems. Last week, The Cruise Examiner advised that a circular sent by Britain's "Daily Mail" to potential advertisers had reveled that its readers spent on average £722 per person on board ship, or about $1,155 each, and in excess of £1,000 (about $1,600) on each cruise. Well, the "Mail" must have read the question we asked last week, which was "The Cruise Examiner wonders what their measure is? Has the 'Daily Mail' made an error or is there something some of the cruise lines would rather not tell us?" This week, however, the same circular from the "Mail" contained quite different statistics, claiming that "'Mail' readers are key spenders in your industry. On average, 'Mail on Sunday' readers spend £1,741 per person per cruise, with an additional £557 on-board spend." At $2,785 per cruise and $890 onboard spend, these figures meet the more generally accepted industry norm of about 25% of total cruise spend being spent on board ship. But these figures are historical and apply to the UK market. It is still quite likely that booking some cruise products will ultimately see consumers spending up to 40%, or even more than half their cruise spend on board ship. These days, the ticket price is less than it used to be as a proportion of total spend, and in addition to 40% off and two-for-one deals, cruise lines frequently offer no single supplement for sole travellers, depending on how badly they might need the business.